Preface. Introduction. I Infrastructure: Crawling the Web. Web search. II Learning: Similarity and clustering. Supervised learning for text. Semi-supervised learning. III Applications: Social network analysis. Resource discovery. The future of Web mining. 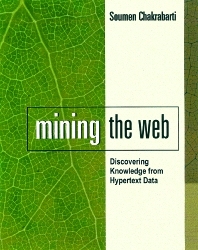 Mining the Web: Discovering Knowledge from Hypertext Data is the first book devoted entirely to techniques for producing knowledge from the vast body of unstructured Web data. Building on an initial survey of infrastructural issues—including Web crawling and indexing—Chakrabarti examines low-level machine learning techniques as they relate specifically to the challenges of Web mining. He then devotes the final part of the book to applications that unite infrastructure and analysis to bring machine learning to bear on systematically acquired and stored data. Here the focus is on results: the strengths and weaknesses of these applications, along with their potential as foundations for further progress. From Chakrabarti's work—painstaking, critical, and forward-looking—readers will gain the theoretical and practical understanding they need to contribute to the Web mining effort. A comprehensive, critical exploration of statistics-based attempts to make sense of Web Mining. Details the special challenges associated with analyzing unstructured and semi-structured data. Looks at how classical Information Retrieval techniques have been modified for use with Web data. Focuses on today's dominant learning methods: clustering and classification, hyperlink analysis, and supervised and semi-supervised learning. Analyzes current applications for resource discovery and social network analysis. An excellent way to introduce students to especially vital applications of data mining and machine learning technology. Soumen Chakrabarti is assistant Professor in Computer Science and Engineering at the Indian Institute of Technology, Bombay. Prior to joining IIT, he worked on hypertext databases and data mining at IBM Almaden Research Center. He has developed three systems and holds five patents in this area. Chakrabarti has served as a vice-chair and program committee member for many conferences, including WWW, SIGIR, ICDE, and KDD, and as a guest editor of the IEEE TKDE special issue on mining and searching the Web. His work on focused crawling received the Best Paper award at the 8th International World Wide Web Conference (1999). He holds a Ph.D. from the University of California, Berkeley.